The Crooked Banana: A Dress! Yes! I did it! 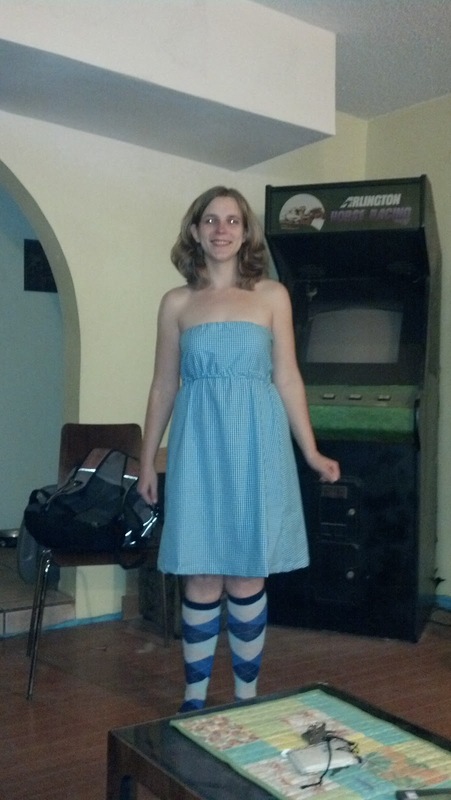 I made a dress! I used some mostly cotton gingham I bought online. I didn't follow a pattern, so I'm sure I didn't do anything the "proper" way. But still! Look! A dress! It fits! And it's blue! :D I totally forgot to get Mario to take a good picture with it on me, but here's a silly cell phone photo of me right after it was made. I know. My eyes are all crazy and I'm wearing knee high argyle socks. But the socks were just what I was wearing under my jeans and boots that day! I have no excuse for the rest of the ridiculousness in the picture. Like the horse racing arcade machine. Mario bought it to convert into a MAME cabinet. At least, I think those are the right letters. It's basically an arcade cabinet on which you can play a huge number of awesome classic games instead of just one. But so far that hasn't happened and we still have Arlington Horse Racing instead. *sigh* Maybe I should just stand in front of it to model all the clothes I make. Might be kind of fun! Linking up to Let's Get Acquainted at Plum and June! Your dress is very cute! And, hey, the socks match! Congrats on your first dress, well done. I'm looking forward to seeing more of your work. Yay on your first dress. Isn't it fun to create without a pattern?